Samsung has a device that is capable of playing VR and 360-degree videos, and a headset capable of personalising the experience. All it needed was a camera to shoot the immersive clips and the entire ecosystem would be complete. That’s where the Samsung Gear 360 camera comes in. It’s a small(ish), spherical object with two extremely wide-angle lenses situated front and back that can shoot 360-degree stills and rolling footage. The two lenses, and their respective 16megapixel sensors, can be used together to form a a combined image taking in the entire surroundings that can be then uploaded directly to YouTube, Facebook, even Google Street View. Each lens has a 195-degree view, which is locked off to 180-degrees each to give the system some overlap to stich the front and back captured video or stills together. And although the camera can be operated independently, it works best in tandem with a Gear 360 smartphone app, that does all the social sharing and image stitching for you. Running on a Samsung Galaxy S7 edge, the app works very quickly indeed. It stiches and saves video or images in a very short space of time. You can also use the app to watch footage back, swiping to move the viewpoint around. Or you can use it to watch clips in a Gear VR headset, turning the whole thing into a genuine VR experience. The video or stills aren’t in 3D, but you still get a sense of being there. The app can also be used as a Bluetooth remote for the Gear 360, with live action displayed on the screen. If you don’t particularly want 360-degree views for your extreme sports action or whathaveyou, you can also use the Gear 360 as a single-lens camera. It will shoot 180-degree wide-angle photos or clips independently, with the other lens switched off. There’s a tiny screen on top if you want to use the camera on its own, and a flap on the side can be opened to reveal a removable battery and microSD card slot. There’s also a Micro-USB port. A generic camera screw fitting can be found underneath, so you can attach it to a number of existing third-party accessories. A mini tripod that can also be used as a handle, comes with it in the box. One of the big question marks hanging over virtual reality is about content. It’s all well and good the headsets arriving in their droves this year, but we’re going to need more and more content to watch and play when using them. 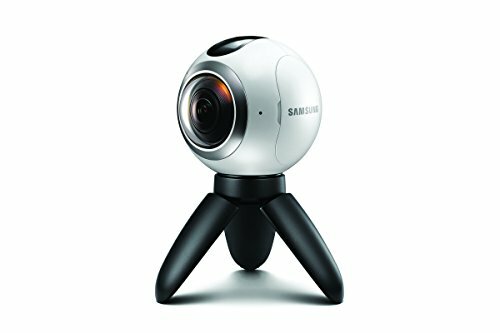 The Samsung Gear 360 and devices like it will be essential therefore for rapidly expanding the amount of video available to VR enthusiasts. What’s more, it provides normal members of the public the means to make their own clips and family videos for viewing in a more immersive fashion that ever before. It’ll boil down to the price of course, but we get the feeling that Samsung will keep it affordable. After all, it wants to sell more Gear VR headsets and the smartphones to drive them too.